Captivated by diversity, the team passionately provides effective ways to design and build homes that speak to the unique style of each client. Clarity Homes was started with one goal in mind in 1998: to provide affordable luxury homes. Since its inception, the multi-generational family-owned company has remained true to providing its clients with what they want: high-end design at an affordable price. 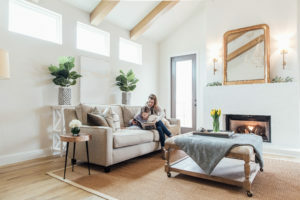 The expert team at Clarity Homes, driven by design, is committed to building homes that speak to the unique style of each client-simplifying their lives. Clarity Homes builds personalized homes in boutique communities that fit the modern lifestyle of their clients. The team focuses on building what is right for their clients and provides access to the latest smart home features at no additional cost. While their homes reflect values with classic appeal, it is not uncommon to see a tudor-style home, modern farmhouse, quintessential cottage, or authentic craftsman-style home in their portfolio. Clarity Homes approaches its jobs from a holistic perspective. From concept to completion, Clarity Homes’ team of experts ensures the job is done right and efficiently. The team at Clarity Homes has good standing with the Master Builder group, Fort Worth Builders Association, and Parker County Builders Association, to name a few. They are members of the National Association of Home Builders and earned the Energy Star designation. Clarity Homes has also participated in NAHB’s prestigious Builder’s 20 club. As a small business, Clarity Homes competes at the level of national competitors and excels in North Texas. With architecture rooted in modern lifestyle that is refined and simplified, the homes built by Clarity Homes withstand the test of time for generations to come.